Founding president of UCF’s Puerto Rican Student Association and PR native Jose Rivera reflects on Hurricane Maria. 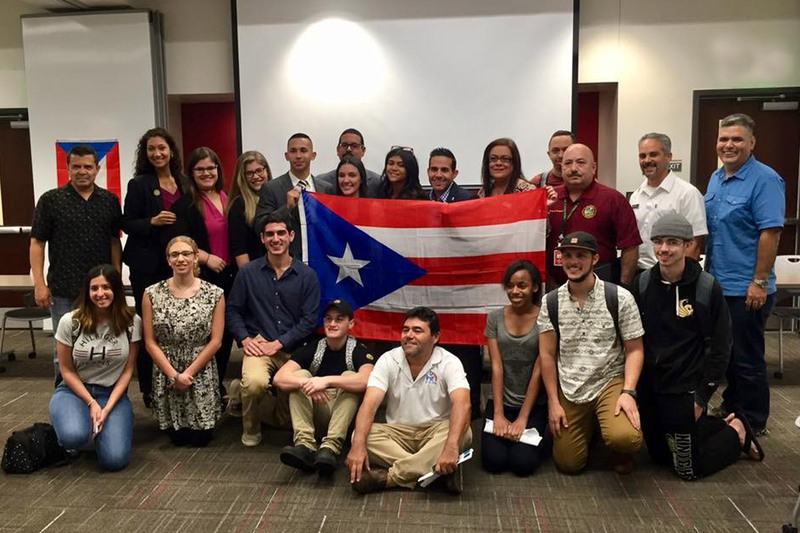 Jose Rivera (third from bottom left) and other members of UCF's Puerto Rican Student Association. When senior economics major Jose Rivera founded the Puerto Rican Student Association at UCF in mid-September 2017, he had no idea that within a few days the organization’s priorities would switch from primarily uniting students on campus to helping relief efforts for the island after Hurricane Maria swept through on Sept. 20. The storm results were devastating: The Puerto Rican government says 2,975 were killed, more than 500,000 homeowners reported damage and about 40 schools closed permanently. Power was finally restored to the last neighborhoods this summer. Rivera and the association have spent the past year focusing on helping their homeland after the Category 4 hurricane hit. Heading into National Hispanic Heritage Month (Sept. 15 – Oct. 15) and the one year anniversary of when Hurricane Maria made landfall, we asked Rivera about starting the organization that supports Puerto Rican students, who are part of the 26 percent of UCF students who are Hispanic. Why did you initially start the PRSA on campus? I initiated the process to start the organization right after Irma impacted Florida (Sept. 10). I am a transfer student from Eastern Florida State College to UCF, so Fall 2017 was my first semester at UCF. I wanted to challenge myself to start PRSA at UCF because it was unthinkable that there was no PR student organization given the growth of Puerto Rican population in Central Florida. I was the founder and former president of the Hispanic Club at EFSC, so I already had the experience and drive to start PRSA at UCF. How did the association’s mission change after Hurricane Maria hit the island last year? Our mission never changed, but our priorities did. It was our moral duty to allocate all our efforts and resources towards contributing to the relief efforts. Originally our focus was organizing activities that would unite PR students at UCF, but the efforts we were doing for relief did both: United us and gave us a greater sense of purpose. We were able to identify that the best and more effective way we could help and contribute to the relief was by being of direct support to our PR-Central Florida community and to the PR students at UCF. How is the association helping in the relief effort? Right after Irma, the PR-Central Florida community created CASA which was an entity that united organizations from around Florida to help in the relief efforts. We were one of the organizations to first support the creation of CASA. CASA became our community partner in the relief efforts, and we contributed through volunteer work and by providing item donations. At UCF, we organized a student forum for our members to express their stories, we did item collection, and partnered with UCF’s Counseling and Psychological Services to offer clinical support. After Maria swept over the island, UCF extended in-state tuition rates to students in Puerto Rico affected by the hurricane. How has the association been able to help students who have come to UCF because of that? The in-state tuition extension was our biggest relief effort and our biggest accomplishment. Most universities in the state had extended two semesters of in-state tuition (Fall 2017 and Spring 2018) for already enrolled PR students and one semester (Spring 2018) for those newly arrived transfer students, by request of Gov. Scott. We took a leading role in partnering with the SGA President Nick Larkins to present a motion at the UCF Board of Trustees meeting to extend the in-state tuition waiver up to Spring 2019, and the BOT unanimously approved the motion. We also worked to quickly connect with newly arrived PR transfer students. And with the help of Cyndia Muniz from the Office of Diversity and Inclusion and our members, we were able to connect with most of them. We also helped them in the process of adapting and having a smooth transition to UCF. What else are you involved with at UCF? I work as a research assistant for Fernando Rivera, associate professor of sociology and director of the Puerto Rico Research Hub at UCF, and serve as the executive director for the National Puerto Rican Student Coalition Inc. I also was the first president of the Puerto Rican Student Association at UCF. During this past summer, I worked at the Office of the Governor of Puerto Rico, and during the summer of 2017 at the Senate of Puerto Rico. How often have you been home since Maria hit? Twice. During the Christmas break of 2017, and this summer when I worked at the Office of the Governor. I spent time with my family, helping in whatever way I could and working full-time. What are some of the biggest challenges and opportunities for Puerto Rican students who come to UCF? The biggest challenges are: 1) the financial struggle (the in-state tuition waiver is a great relief); 2) the cultural/transition shock (PRSA plays a big role in alleviating this impact), and 3) the language barrier (as the students practice their English they start feeling more comfortable). The biggest opportunities are: 1) being exposed to a different perspective to that of an island; 2) having greater access to opportunities and job security, and 3) giving them hope about the future and a sense of success. I plan to go to graduate school and complete a master’s in applied economics either in Florida or Washington, D.C.
How has your time at UCF affected you? It has made me an individual that understands the importance of “community” and an even prouder UCF Knight knowing that although we are one of the largest universities in the nation, we still value and preserve our sense of community with high regard.